Lansing GH80 78” Gear Hobbing Machine s/n 03 w/ 2000mm (78.74”) Max Dia, 15mm (.59”) Max Module, 63” Table, Change Gears, Tooling, Coolant. G & E Gould & Eberhardt No. 72S 72” Vertical Gear Hobbing Machine w/ 12-160 Cutter RPM, 1 Thread Index Worm, 120 Teeth in Index Worm Gear, 49” Table, Change Gears, Tooling Risers, Coolant. G & E Gould & Eberhardt No. 60S 60” Vertical Gear Hobbing Machine w/ 26” Table, Change Gears,Coolant. Overton mdl. FD-800 Vertical Gear Hobber Series 2 s/n 23 w/ 31.5” Max Dia, 3DP Max, 36” Max Length, Change Gears, Tooling, Coolant. Overton mdl. FD-500 Vertical Gear Hobber Series 15 s/n 327 w/ 20” Max Dia, 3DP Max Pitch, 4” Max Axial Travel, 11” Max Vertical Travel, Change Gears, Tooling, Coolant. Overton mdl. FD-500 Vertical Gear Hobber Series 4 s/n 305 w/ 20” Max Dia, 3DP Max Pitch, 4” Max Axial Travel, 11” Max Vertical Travel, Change Gears, Tooling, Coolant. Overton mdl. FD-500 Vertical Gear Hobber Series 4 s/n 301 w/ 20” Max Dia, 3DP Max Pitch, 4” Max Axial Travel, 11” Max Vertical Travel, Change Gears, Tooling, Coolant (NEEDS WORK). Overton mdl. FD-320A Vertical Gear Hobber Series 20 s/n 903 w/ 12” Table, Change Gears, Coolant. Overton mdl. FD-320 Vertical Gear Hobber Series 20 s/n 883 w/ 12” Table, Change Gears, Coolant. 30 Deg Max Helix Angle, Change Gears, Coolant. Internal Max Face Width, 30 Deg Max Helix Angle, Change Gears, Coolant. Fellows 6-TYPE Gear Shaper w/ 18” Max Pitch Dia, 5” External – 3” Internal Max Face Width, 30 Deg Max Helix Angle, Change Gears, Coolant. Fellows High Speed Gear Shaper s/n DPC-23595 w/ Change Gears, Riser, Coolant. Gleason 12” Straight Bevel Gear Generator s/n 20351 w/ Change Gears, Coolant. Gleason 12” Straight Bevel Gear Generator s/n 18089 w/ Change Gears, Coolant. Gleason 12” Straight Bevel Gear Generator s/n NA w/ Change Gears, Coolant. Brown &amp; Sharp No. 2-26” Gear Hobber s/n 529 w/ Center, Coolant. Newark 24” Gear Hobber s/n 984 w/ 15-145 Cutter RPM, Power Feeds, Change Gears, Coolant. Newark 24” Gear Hobber w/ 15-145 Cutter RPM, Power Feeds, Change Gears, Coolant. Barber-Coleman No. 3 Gear Hobber s/n 2633 w/ Change Gears, Coolant. W.E. Syles Gear Shaper w/ 10” Table, Coolant. Cross No. 55 Universal Gear Chamfering Machine w/ 18” Max Gear Dia, 14” Gear Face Cap, 1 ½ Pitch, 16 Module. Barber-Coleman mdl. HRS 12” x 20” Combination Sharpening Machine s/n 152 w/ Indexing Work Head. Barber-Coleman mdl. 4HS Hob Sharpening Machine s/n 35. Star Cutter Co. No. 25 Key Seater Machine s/n 645733 w/ 28” x 28” Table. Baker Brothers No. 0 Key Seater Machine w/ 9” Cut Length, 1” Max Keyway Cap. Mitts &amp; Merrill No. 3A Broaching Machine. Newark mdl. 3X246 Gear Checker. Pratt &amp; Whitney 6” Model C 6” x 120” Thread Milling Machine s/n 323 w/ Change Gears, Steady Rests, Coolant. Lees-Bradner 15” x 98” Thread Milling Machine s/n HT-612 w/ Change Gears, Steady Rests, Coolant. Lees-Bradner mdl. HT 48” Thread Milling Machine s/n HT-1136 w/ 10” 3-Jaw Chuck, Tailstock, Steady Rest, Coolant. Webb YAM-2500HG mdl. 22100G 22” x 100” Geared Head Gap Bed Lathe s/n B77045 w/ Trak DRO, 25- 1500 RPM, Tailstock, Steady Rest, Tool Post, 12” 3-Jaw Chuck, 16” 6-Jaw Chuck, Coolant. Webb YAM-1500H mdl. 2260 22” x 60” Geared Head Gap Bed Lathe s/n B67048 w/ Trak DRO, 25-1500 RPM, Taper Attachment, Tailstock, Steady Rest, 12” 3-Jaw Chuck, Coolant. 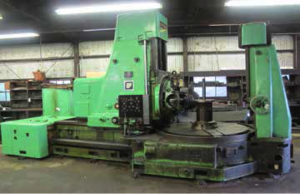 Webb YAM-1250HG 22” x 52” Geared Head Gap Bed Lathe s/n B57069 w/ Trak DRO, 125-1500 RPM, Metric Threading, Tailstock, Steady Rest, Tool Post, 12” 3-Jaw Chuck, Coolant. 12” 3-Jaw Chuck, 15” 4-Jaw Chuck. American Tool Works 24” x 70” Geared Head Lathe w/ Taper Attachment, Inch Threading, Tailstock,18” 4-Jaw Chuck. Bement Miles &amp; Co. 72” Vertical Boring Lathe w/ (2) Vertical Facing / Boring Heads, 72” Chuck. Warner &amp; Swasey No. 1A Turret Lathe w/ 6-Station Turret, Cross Slide, Power Feeds, 12 ½” 3-Jaw Chuck. Warner &amp; Swasey No. 2A Turret Lathe w/ 6-Station Turret, Cross Slide, Power Feeds, 5” 3-Jaw Chuck. Warner &amp; Swasey Turret Lathe w/ 6-Station Turret, Cross Slide, Power Feeds, 18” 4-Jaw Chuck. Feeds, 18” x 118” Table, Coolant. Power Feed, 9” x 42” Table, Bridgeport Shaping Attachment s/n E2988 w/ 70-420 Strokes/Min. Milwaukee No. 2 mdl. H Vertical Mill w/ 50-Taper Spindle, Power Feeds, 10” x 50” Table. Import mdl. HR-150A Rockwell Hardness Tester. Mitutoyo 2”-12” OD Mic Set. Starrett OD Mics to 24”. Mitutoyo OD Mics to 9”. MG 12” Dial Height Gage. 80”, 72”, 40” and 24” Vernier Calipers. Mitutoyo, Fowler and Helios 12” Dial Calipers. Mitutoyo 2.975”-6.075”, 1.975”-3.075” Dial Bore Gages. Starrett and Scherr Tumico ID Mics. Trans, AC, 76,301 Miles, VIN# 1FTBF12265NB32636. White 40 mdl. MA-40 4000 Lb Cap LPG Forklift s/n 5301484 w/ 2-Stage Mast, 130” Lift Height, Cushion Tires. 2002 Mercedes SL-500 Convertible Hard Top. Office Furniture and File Cabinets. Carlton 15” Column x 6’ Radial Arm Drill w/ 15-1500 RPM, Power Column and Feeds, 32” x 28” x 22”Adjustable Angle Tooling Fixture. Shen Jang mdl. BS-15A 15” Automatic Horizontal Band Saw. Peerless Automatic Hack Saw w/ Conveyor. Lincoln Idealarc DC-400 CV-CC- DC Arc Welding Power Source. Lincoln Idealarc TIG-300/300 AC/DC Variable Voltage Arc Welding Power Source. Walker Turner 2-Head Gang Drill Press w/ 24 ½” x 35 ½” Table. Mackey mdl. 15-50 50-Ton Long Stroke Hydraulic H-Frame Press s/n 2003 w/ 18” Stroke. Rotorex Tool and Cutter Grinder w/ Motorized Work Head. Darex mdl. BK-65 Large Diameter Precision Drill Sharpener w/ Stand. Large Diameter Pedestal Drill Sharpener. Queen City 10” Pedestal Grinder. Jet mdl. DC-650 Dust Collector. Ingersoll Rand T30 10Hp Horizontal Air Compressor w/ 80 Gallon Tank. Drills, Taps, Reamers, Endmills, Broaches, Thread Mills, Hobbing Mills. Rutland 8” 3-Jaw Indexing Chuck.